Luxor Temple, or The Temple of Luxor, is among the most beautiful Temples in Egypt. It was known in the New Kingdom period as Ipt-Rsyt, which means the southern shrine. This was to differentiate between this Temple and Karnak Temple, which was the northern house of Amon Ra. Amenhotep III built Luxor Temple. The architect and overseer of the works of construction was the genius Amenhotep, son of Habu. The Temple run close and parallel to the river Nile from north to south. It was constructed on the site of a small Temple of Amon, built by kings of the 12th dynasty. the Temple was only 190m in length and 55m in width. Basically, Luxor Temple was consecrated to Amon Ra in his fertility aspect. 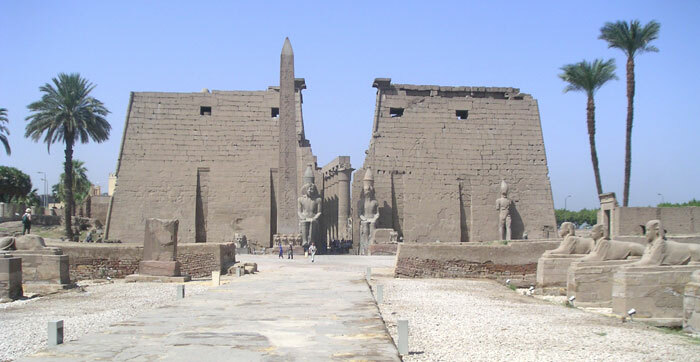 Ramses II, with the help of his architect Pak-in Khonso, added the front part and completed the Temple. He also added the present large forecourt, and a Pylon at the (northern) front of the Temple. Kings Merenpetah, Seti I, Ramses III, Ramses IV and Ramses VI built many more small additions. Alexander the Great rebuilt the Sanctuary. During the Christian era, the inner section was converted to a church. The Muslims built a Mosque in the 10th century, which is known as the Mosque of Abou El-Hagag. 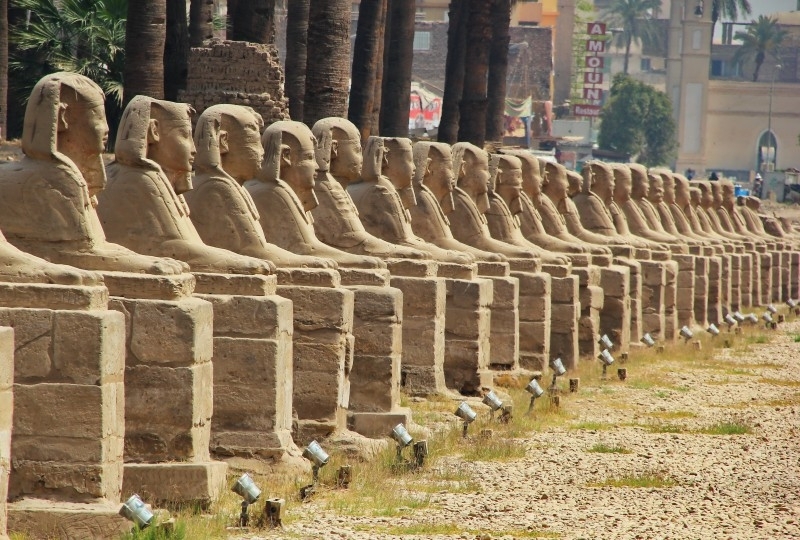 King Nektanebo built the Sphinx Avenue in front of the Temple that leads to the entrance. In front of the Great Pylon of Ramses II, there once were 2 obelisks. Only one of them remains standing! The other was transported, in 1819, to La Place de le Concorde in Paris, as a gift to King Philip Louis of France by Mohamed Ali (who ruled Egypt 1805-1850 A.D), after he was given a French clock, which has never worked properly – even to this day! There were 6 standing statues in front of the Pylon, only one of them, on the western side, is still in place. Flanking the gate of the first pylon, which is 24m high, there are two seated colossi representing King Ramses II, seated on his throne, with all the royal features. Both towers of this pylon were once decorated with relief’s depicting the Battle of Kadesh, fought between the armies of Egypt and the Hittites, in present day Syria. The 1st open court has double rows of 32 papyrus bud columns. To the right side of the open court there is an old triple shrine made by Queen Hatshepsut and Tuthmosis III, dedicated to the sacred boats of the “Triad of Thebes”. To the left is the Mosque of Abou El-Hagag. The open court of Ramses II leads to the Colonnade, which was built by Amenhotep III, and decorated by Tutankhamen and later, Horemheb; Seti I, Ramses II, and Seti II all recorded their names there. It consists of two pairs of large open papyrus columns, which are arranged to make a long processional avenue. The walls of this colonnade are decorated by scenes of the Opt Festival, special ceremonies for the visit of the “Triad of Karnak” to the Temple of Luxor. This feast lasted for about 24 days, including the return to the Karnak Temple. The colonnade leads to the Court of Amenhotep III (52m in length and 46m in width). 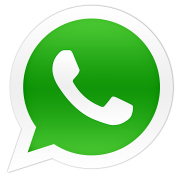 It has a double row of clustered round papyrus bud columns on three sides. The Court of Amenhotep III leads to the Hypostyle Hall, which consists of 32 columns arranged in 4 columns and 8 columns each. To the left of the Hypostyle Hall stands a Roman altar, bearing Latin inscriptions, dedicated to Emperor Augustus. there are some reliefs representing Amenhotep III hunting and killing a gazelle in front of Amon Ra, and other scenes representing the King in front of various deities. 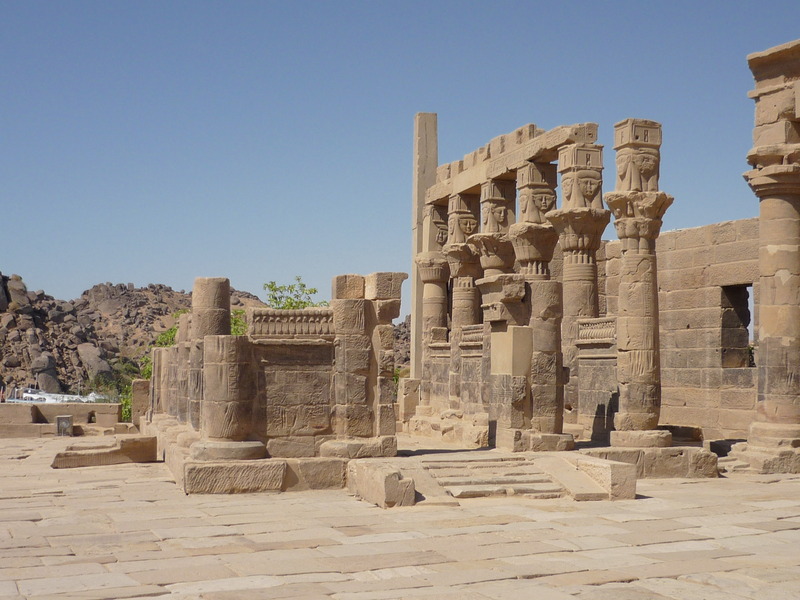 On the rear of The Hypostyle Hall, and on both sides of the central doorway, There are 2 long chapels. The one to the east is dedicated to Mut and the One to the west dedicated to Khonso. The Hypostyle opens south to the 1st Antechamber, which originally had 8 columns, but they were removed when the antechamber was converted into a Christian Church. The Birth Room situated to the east, is a side room with 3 columns. Most of the scenes, depicting the divine birth of King Amen-hotep III, are in very poor condition. After the Birth Room there is another 3 columned chamber, also with badly damaged relief’s, and then the Sanctuary of Alexander the Great. who removed the 4 original columns and built a chapel, open to the north and to the south, rebuilt this sanctuary, which once had a golden plated statue of Amon Ra. Fortunately he did not remove the relief’s on the walls. From the shrine of Alexander the Great, we enter a 2nd antechamber, which has 4 papyrus bud columns. After passing the 2nd antechamber, there are 2 offering rooms, in poor condition, with their scenes also badly damaged. The original sanctuary is a small chamber with 4 clustered papyrus columns. The walls of this room are decorated with scenes depicting Amenhotep III dancing before the God Amon Ra. The outside walls of the Temple, on the west side, are covered with scenes and inscriptions, again representing the battle of Kadesh. This was the work of Ramses II to commemorate his “victory” over the Hittites.